This overnight Rishikesh camping trip is perfect for thrill-seekers looking for a quick escape into the wild. You'll spend time at a delightful campsite, trying your hand at kayaking, rock-climbing and rappelling, or relaxing and taking in nature, depending on what you're looking for. In the evening, you'll enjoy a bonfire before dinner. It's the perfect way to relax this weekend! IMPORTANT: This camping in Rishikesh is not a fixed departure trip. It requires a minimum of 2 pax for a booking confirmation. Your rafting camp in Rishikesh is located near Beasi or Byasi. This is one of the finest spots in the Rishikesh region, for rafting and for camping, and you'll be the lucky ones to do both. The campsite is just across the road from the river, and you'll be able to walk to the water in just five minutes. The river is clean and refreshingly cool, perfect for swimming, kayaking and paddling, and the white sand beach is the perfect place to spend the day. Your tents are air-cooled, with comfortable beds inside. There are also dry pit toilets and showers with fresh running water at the campsite. • Camp in air-cooled tents just a short walk from the river. • Spend the day playing on a white sand beach across from the campsite. Participants must be in good health and in a good physical condition. It is vital that participants with medical problems make them known to the operator well before departure. If you suffer from severe muscular, chest, heart or bronchial disorders, or if you are a severe asthmatic, or have high blood pressure, you are strongly advised against participating. For cancellations made more than 30 days before departure of rafting and camping in Rishikesh: 75% of the trip cost will be refunded. For cancellations made 29-15 days before departure of rafting and camping in Rishikesh: 50% of the trip cost will be refunded. For cancellations made 0-14 days before the Rishikesh rafting and camping: No refund. The trip cost for the rafting and camping in Rishikesh is quoted as a package. No partial refunds or credit will be given for services not used. Please note that departure time for this Rishikesh camping trip is subject to change based on multiple factors and participants need to keep their schedule flexible for the day. The operator may need to change the schedule or route due to weather, political restrictions or any other cause. In the event of a change, postponement or delay, participants have no right to claim the refund of the trip price (in whole or in part) or other compensation for any injury, loss or damage. Children below 5 years can stay for free (no separate bed will be provided). Children between the age of 6-12 years will be charged INR 1500 per night. Children above the age of 12 years will be charged as adults. This trip does not include pick-up. You'll check in to your campsite just before lunch. Do try to arrive on time so you can settle into your air-cooled tents, and look around before lunch is served. After a delicious meal, you'll receive a briefing about the campsite, and then you can choose how you want to spend the day. You can take it easy, or head out for beach volleyball, kayaking, rock-climbing, or rappelling. As the evening turns to night, a bonfire is lit to keep you warm, and you'll end the day with a delicious hot dinner. Overnight in tents. Check in and start the fun! Wake up early to get the best views of the river, and then dive into a hearty breakfast. Enjoy some time at the river and along the white sandy beach, before heading back. Check out time is 11:00 hrs. Trip ends here. Enjoy a peaceful morning at your campsite in Rishikesh. 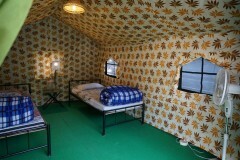 Deluxe twin-sharing air-cooled tents with camp cots, mattresses, quilts, cane chairs and a table. 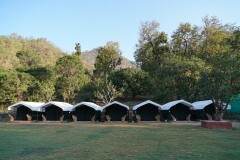 Toilet tents with dry pits and western-style commodes. 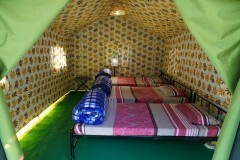 Check in to a comfortable tent in Rishikesh. You will wake up early to a delightful morning, and enjoy a wholesome buffet breakfast that includes fresh fruits, tea and coffee, cornflakes with milk, toasted break with butter or jam, eggs, paranthas/bhatura with chola or curd and poha or porridge. After that, it's time to pack up and check out by 11:00 hrs. Trip ends here. Dig into a big breakfast before check out. From Rishikesh, head towards Devprayag/Badrinath. Cross Shivpuri and Gular bridge, and look for Byasi. There is a parking area with a sign for Red Chilli Beach Camp just before Byasi market. Park your car here and follow the trail through the woods. It's a five minute walk downhill to the river beach.